A new client in Burr Ridge, Illinois, asked me to design his living room and said he wanted a unique design. He further said he wanted me to create “the WOW! factor” with a design that I’ve never done for another client. An exciting challenge for a designer, right? Well, after giving it some thought, I decided to create “sculptural” window treatments for the five windows in the room. The room has a curved wall with a faux finish with honey, gold, gray and a hint of golden green. That was my base for a color scheme. We selected furniture with contemporary styling, in black and gray with a hint of rust/copper. The coffee table was very interesting! It’s oval-shaped and finished in copper, resembling a smooth pebble. Deep thought was given to the design of the five tall, slender all windows. I needed to create a design to enhance the overall look of the room and the play up the height of the windows. I found this amazing fabric that was perfect in terms of colors and texture. The background was in blackened, antiqued silver with woven lines of copper that stretched up and down across the length of the fabric. Perfect choice! I also found an amazing trim with diamond stones woven in rows across the band, which added amazing elegance and style. Voila! Unique idea, I hadn’t done this before, and I was positive that my client would love it! As expected, the client approved. Construction and installation took 12 weeks, a little longer than average; the delay was because I had to find the perfect electrician to make my design come to life. Call (630) 420-0800 For free consultation and estimate! Meson Sabika a famous Spanish Tapas restaurant located on Aurora Ave. in Naperville Illinois. Sheer, lace fabric was selected for this pinch pleated drapery panels. The lace goes well with the traditional style building as well as the Spanish style in general. 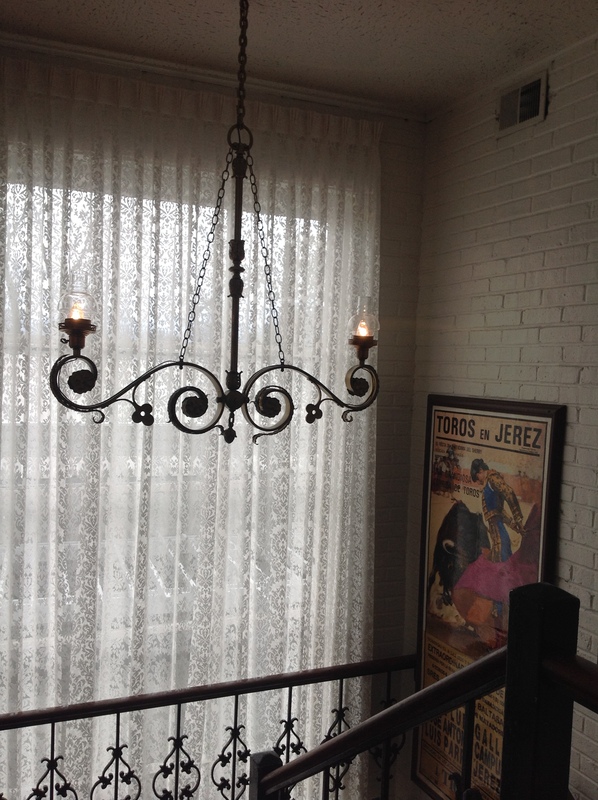 In addition, to use lace as an element to support the historic style, lace will allow more light in the space, which was one of the requirements the client totally welcomed. 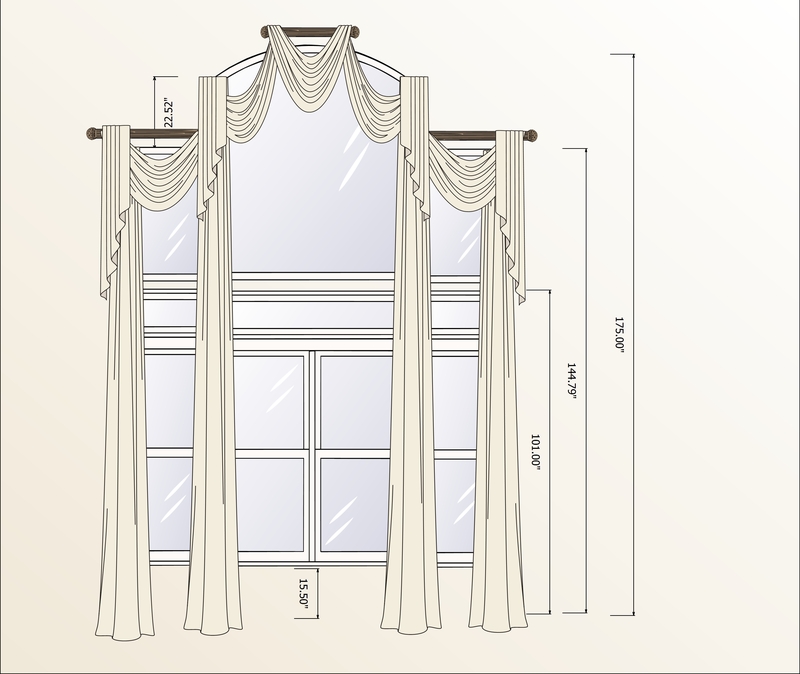 Below is a proposed window treatment for our client from Naperville, Illinois. The swag treatment was chosen for it’s grand feel, especially we are using a combination of burned velvet with silk! The central swag, the cascades, and the panels, all will be made out of the burned velvet. the other swags and the lining of the cascades will be out of silk. The hardware was selected from the Paris Texas collection. I am thrilled and excited and can not wait to see the treatment installed!